HRANA News Agency – On December 6, Maryam (Nasim) Naghash Zargaran, Christian convert returned to Evin prison by the end of her furlough and also 42 days has been added to her sentence because of her “absence”. HRANA News Agency – On November 27, 2016, Maryam (Nasim) Naghash Zargaran, Christian convert was sent to a 5-day furlough from Evin prison. 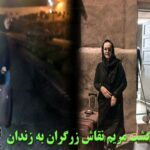 HRANA News Agency – Maryam (Nasim) Naghash Zargaran, returned to Evin Prison due to opposition to an extension of her leave by the Prosecutor despite not finishing her medical treatment process. The Prosecutor has rejected her request for a parole, too. 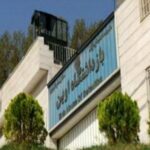 HRANA News Agency – Maryam (Nasim) Naghash Zargaran, a Christian and ill prisoner of women’s ward in Evin prison was sent to an extendable medical furlough, on Tuesday, August 28. 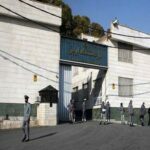 HRANA News Agency – Maryam (Nasim) Naghash Zargaran, imprisoned Christian and ill prisoner of women’s ward of Evin prison, ended her hunger strike after the promises of authorities. 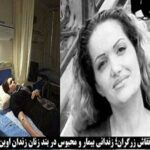 HRANA News Agency – The mental and physical condition of Maryam (Nasim) Naghash Zargaran, Christian convert is not good on the 26th day of her hunger strike in Evin prison. Ms. Zargaran suffers from “severe depression”, her blood pressure is very low and she suffers from pain and numbness in her legs. Although the coroner has confirmed her heart disease, the security institutions are preventing her from having parole. HRANA News Agency – Maryam (Nasim) Naghash Zargaran, Christian convert in women’s ward of Evin is on the 23rd day of her hunger strike. The prisoner’s mother has sit in front of the camera and expressed her concerns about her daughter’s situation and explained what had happened to her daughter during being arrested, interrogated and three years of imprisonment.